It’s still days away, but the energy on college campuses across the nation is already palpable. It’s pulsing on Facebook, too, where 420 Magazine has netted 1.1 million likes, where a group called “420 Girls” is considered a “political organization,” and where a page that has done nothing more than post a picture of a clock showing 4:20 has nearly 40,000 followers. In its many manifestations — as a date, as a time, as a state of mind — the term “4/20” has come to symbolize an entire marijuana movement. The numbers were a call to arms for activists pushing marijuana’s legalization in Colorado and Washington. And right now, according to the Associated Press, “thousands of people” are expected to arrive in Colorado and Washington this weekend to celebrate April 20 — the unofficial holiday for smoking weed. But perhaps because recreational marijuana use is still illegal in most places, there’s little explanation of why or how 4/20 came to be. For example, Mark Kleiman, Washington state’s pot guru, has no idea how the holiday got its name, according to the Daily Beast. Neither does Warren Haynes, an Allman Brothers Band guitarist who sometime tours with surviving members of the marijuana-friendly Grateful Dead. Some think “420” is the dispatch code for smoking pot. Others think there are 420 active ingredients in marijuana. Some even hypothesize “it has something to do with Hitler’s birthday,” which is April 20. So where does 4/20 come from? 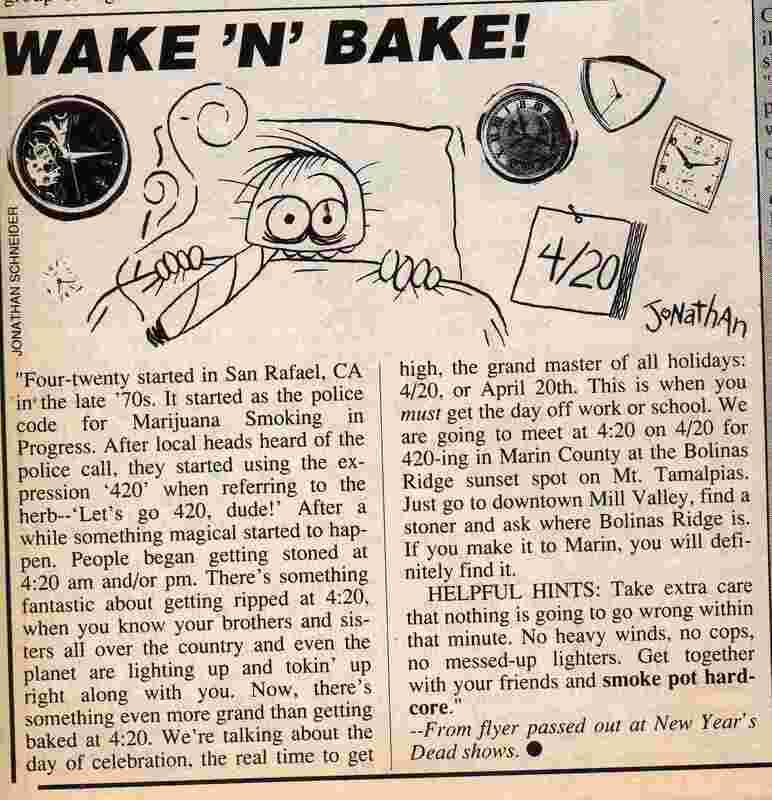 According to the Huffington Post, which took a deep dive on the issue, and High Times, the authority on all things weed, the tale of 4/20 winds back to the year 1971 and a group of high schoolers nicknamed the “Waldos.” The kids, pot smokers all, attended San Rafael High School in Northern California, and heard rumor of a wild patch of herb somewhere nearby for the taking. Eventually “4:20 Louie” just became “4:20.” Then — incredible but true — the Grateful Dead moved to town. The Waldos fell in with a crowd of managers working with the band, members of which eventually heard the term “4:20” and loved it. There’s something fantastic about getting ripped at 4:20, when you know your brothers and sisters all over the country and even the planet are lighting up and tokin’ up right along with you. Now there’s something even grander than getting baked at 4:20. We’re talking about the day of celebration, the real time to get high, the grand master of all holidays: 4/20, or April 20th. The holiday caught fire. Clocks in “Pulp Fiction” were set to 4:20, High Times launched 420.com and a new holiday — albeit an unofficial one — was born.